To have your points added to the leader boards, you MUST email your info (name, or club name, race rounds or club classes won, plus event competed at) directly to IFO at HybridEntertainment78@Yahoo.com within ONE WEEK after each event that you compete at. If you do not email IFO with your winning info within a week after an event, your points may not be added. 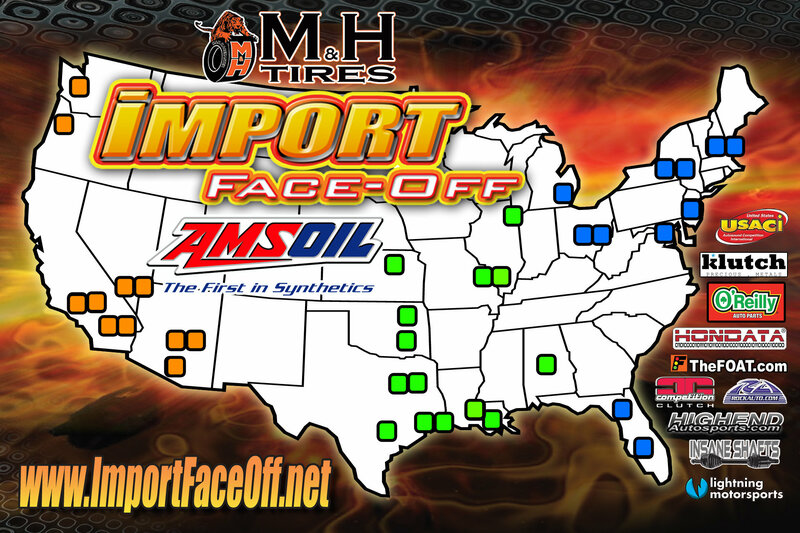 The Import Face-Off Race Points Championship is for Heads Up class racers only. Racers will receive 10 points for each elimination round won for one class at each 2017 event. One champion will be chosen for classes (FWD/FIP/FIS/11.5) and one for classes (AMP/AMS/OL) for 3 different colored regions (see map). In the event of a points tie, winners will be determined by furthest total distance traveled for the season. Winners must run eliminations rounds at a minimum of 2 events. Points go towards your home town region. Car clubs will receive 10 points for competing, 20 points for winning Best Club Participation, or 30 points for Best Club Representation at all 2017 IFO events. Champions will be chosen for 3 different colored regions (see map). Each regional Champion must compete at a minimum of 3 events throughout the year. Champions will receive $1000 each! In the event of a points tie, winners will be chosen by over all club representation. Points go towards your home town region. Minimum 3 team entries required per event to be eligible for car club points and trophies.